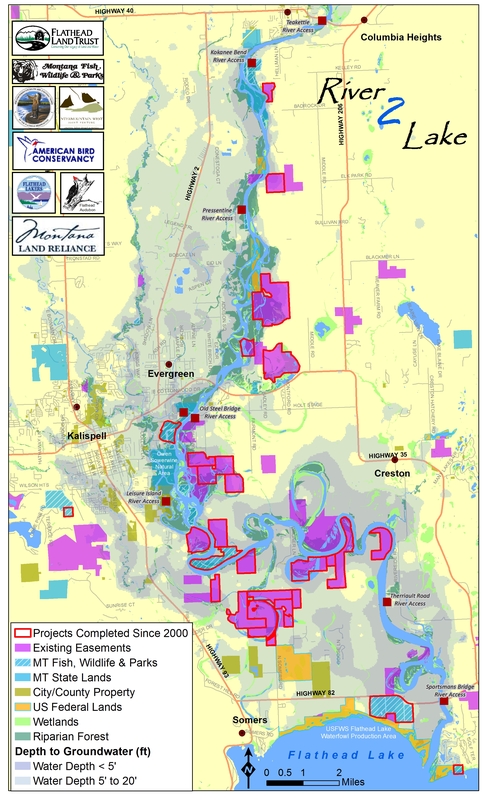 You can part of the Flathead River to Lake legacy of good stewardship so that people can enjoy our Flathead natural heritage for generations to come. Think about initiating a conservation or restoration project on your property. Stories from the Land – the Glenn and Hazel Johnston conservation easement, by Flathead Land Trust. A conservation easement can protect your property’s conservation values for the future. Listen to landowners discuss why they chose to do it. By donating to the R2L Conservation Fund you can help conserve the natural beauty and heritage of Flathead River and Lake. This fund is dedicated to on the ground collaborative conservation projects on the North Shore of Flathead Lake and along the Flathead River. Donations are managed by our partner the Flathead Lakers and are tax deductible. Richard Siderius discusses planting along Ashley Creek to improve water quality. Implementing Best Management Practices on your property can minimize impacts from development, farming and grazing, and protect clean water, fish and wildlife and soils. We have riparian planting projects along the Flathead River, Ashley Creek, and the North Shore of Flathead Lake that could use a hand with planting, monitoring, watering, and weeding. Contact Franz Ingelfinger, Restoration Ecologist, MT Fish, Wildlife and Parks at 406-751-4580, or e-mail him at FIngelfinger@mt.gov to find out how you might help or if you need help planning a riparian restoration project on your property. These are usually Spring, Summer or Fall activities. Contact us to learn more about any of these opportunities or to discuss your own ideas about How You Can Help. Aileen and Jerry Brosten, with Marilyn Wood, former Flathead Land Trust Director, celebrate placing a conservation easement on their land with friends and neighbors. Your story, neighbor to neighbor, word of mouth … about how special this place is, what is being done to preserve its values, and what we can do to keep it special … is a powerful story. Invite your friends and neighbors to see your own conservation project. Lead a tour of your conservation or restoration project for interested landowners. Tell your friends and neighbors about the River to Lake Initiative and the special areas we are protecting. Invite a River to Lake Initiative representative to share information about conservation or restoration options. Tell us your ideas to help spread the word and protect this special place. Whether you are an event organizer, a real estate agent, a boy/girl scout leader, a cook, or a fisherman, or simply love to lead walks or have stories to tell, your experience and skill could help the River to Lake Initiative. We welcome your help and ideas. Give us a call.